The Trio was forged out of a collective desire to draw new and diverse audiences by performing high energy, top quality music. Using social media to broaden their reach beyond the concert stage and classroom, the Trio has its own YouTube channel, which has over 85 million views and 100,000 subscribers, making PROJECT Trio one of the most watched instrumental ensembles on the internet. Double bassist Peter Seymour has performed with many of the world’s most highly acclaimed artists and ensembles, including the Cleveland Orchestra, New World Symphony, Houston Symphony, New York City Ballet, Iris Orchestraand the Colorado Music Festival. He was the recipient of the Downbeat Magazine Award for Best Jazz Soloist and has shared the stage with such luminaries as Wynton Marsalis, Roy Hargrove and Bobby McFerrin. Since the inception of PROJECT Trio, Peter has taken on many roles, including CEO, manager, and community engagement director. He is especially passionate about education and outreach and has organized events for the Trio benefiting over 500,000 students on four continents in seventeen countries and over 40 States. Peter also serves as the director of PROJECT Trio: The Studio, a post graduate program in 21st century chamber music and entrepreneurship that focuses on performance, improvisation, composition, recording, video production, and exploring new business models. Peter received a Bachelor of Music degree from the Cleveland Institute of Music and a Master's Degree in Bass Performance from Rice University where he was a student of Paul Ellison. He lives with his wife and two daughters in Brooklyn, NY. 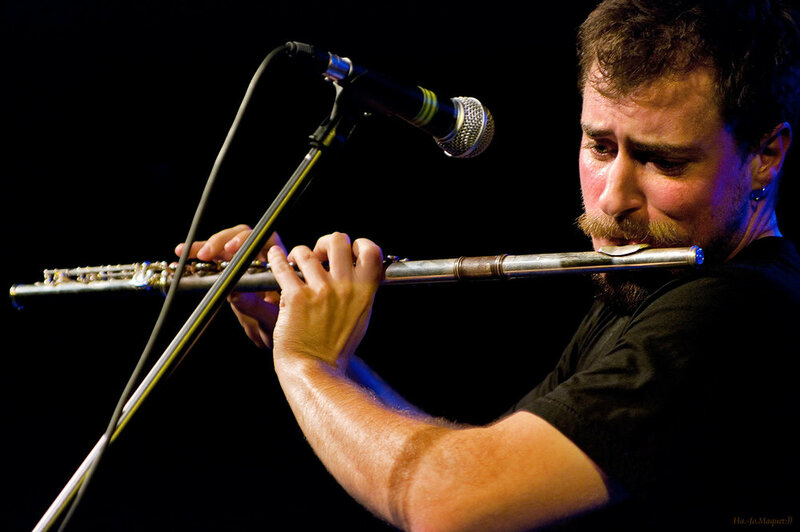 Greg Pattillo is recognized throughout the world for his redefinition of the flute sound. Greg was lauded by the New York Times as "the best person in the world at what he does." His groundbreaking performance videos on Youtube, showcasing "beatbox flute", have been viewed more then 50 million times. As an internationally acclaimed performer, educator, and clinician, Greg can be found both on the concert stage and on the streets, subways, and parks, sharing and preaching his sound. After earning his Masters degree from the Cleveland Institute of Music, Greg found work as at the acting principal flute of the Guangzhou Symphony Orchestra and became a founding member of the Collaborative Arts Insurgency in San Francisco. Mr. Pattillo currently resides in Brooklyn, NY and performs with PROJECT Trio, an ensemble of genre bending bending performers emerging from classical music roots. An exceptionally versatile cellist, Eric Stephenson’s style ranges from classical to jazz to rock and folk. He has performed with numerous orchestras like the IRIS Orchestra in Memphis, TN and the Colorado Music Festival in Boulder, CO. Eric was also a regular substitute for the Cleveland Orchestra. Eric earned his Bachelor and Master of Music Degrees with Honors from the Cleveland Institute of Music and was a recipient of the Ellis A. Feiman Award in Cello while a student of Stephen Geber. As a fellow at the Aspen Music Festival, he served as Assistant Principal Cello of the Aspen Festival Orchestra from 1999-2004. He has appeared as a soloist with the Cleveland Institute of Music Symphony Orchestra and the National Repertory Orchestra in Breckenridge, Colorado. In 2006, Eric moved to NYC and has performed with countless ensembles and spends most of his time performing with PROJECT Trio, an ensemble he co-founded. Composing and recording is a huge part of his life. He has engineered and mixed 2 full length PROJECT Trio albums and premiered 2 works for trio and orchestra. In his spare time, he enjoys biking around Brooklyn and playing the tenor sax.